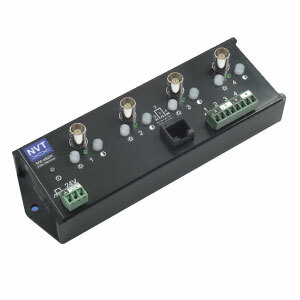 NV-452R 4-channel Video Receiver is an active (amplified) device that allows the transmission of real-time monochrome or color video on up to 1 mile (1,6km) using Category Unshielded Twisted-Pair (UTP) telephone wire. The NV-452R provides signal conditioning in the form of ground lifting, distance EQ and transient protection. The unparalleled interference rejection and low emissions of the Model NV-452R allow long run video signals to co-exist in the same wire bundle as telephone, datacom, or low-voltage power circuits. This allows the use of shared or existing cable plant. Ground-lifting ensures no annoying “hum-bars” when ground potential differences exist. With built-in transient protection, damaging voltage spike problems are eliminated. The built-in sharpness and brightness controls compensate for cable loss.